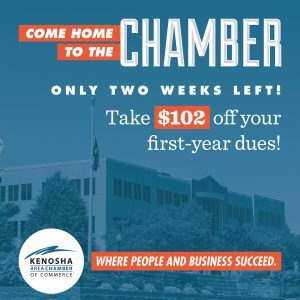 The Kenosha Area Chamber of Commerce has been helping businesses grow and prosper in the Kenosha Area since 1916. To celebrate 102 years, we’re offering $102 off your first-year dues to new members! This deal runs until December 27th, so there is still two weeks left to join at this discounted rate! This is a great opportunity to take advantage of all of the amazing programs and services the Chamber has to offer for a great price. Contact the Chamber for more details or to join!